Sampling the abyss - a voyage into a world of jelly and fangs! Sampling the Abyss – a voyage into a world of jelly and fangs! An international team of 40 scientists and support staff are embarking on a pioneering voyage to study Australia’s eastern abyss, a dark and largely unexplored habitat found deep beneath the ocean surface. This is a voyage into a world of jelly and fangs! The month-long voyage on our research vessel Investigator will survey 14 locations along the east coast of Australia, including seven Commonwealth Marine Reserves (CMR), in a world-first exploration of these abyssal depths. Abyssal depths are defined as those areas of the ocean around 4,000 to 6,000 metres deep. They are remote and alien environments that are generally very poorly studied. 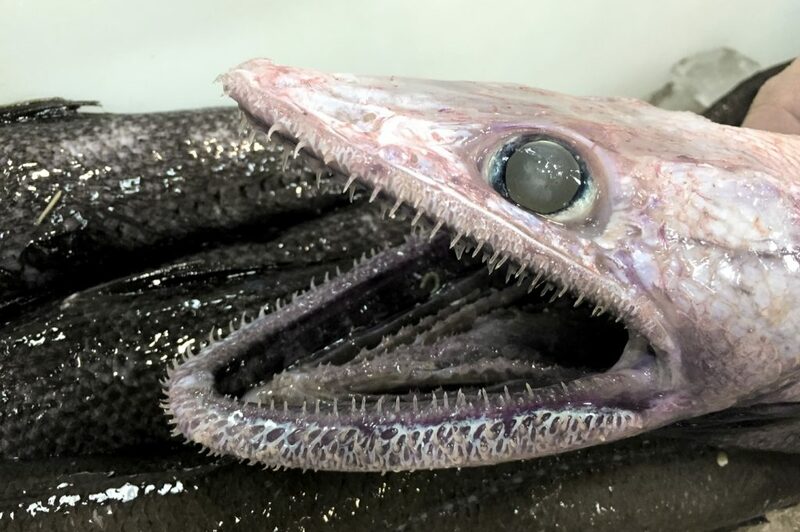 Sloane’s Viperfish is an alien species that lives in the deep ocean, rather than deep space. Image David Paul. This voyage of Investigator seeks to shine a light on abyss life in a world-first survey that involves scientists from institutions in the United Kingdom, Russia, Malaysia, France, Belgium, Austria and, of course, Australia. 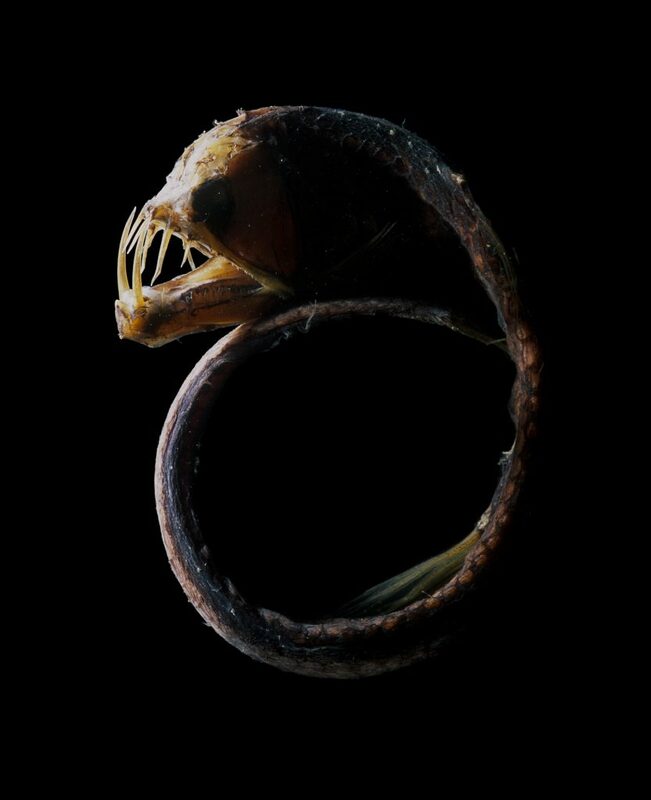 All are excited by the chance to go deep to uncover the weird and wonderful life of the abyss. 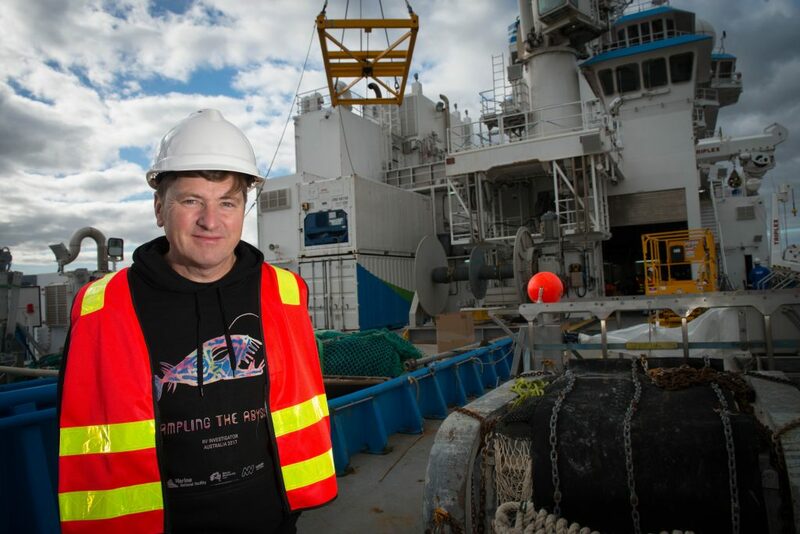 Chief Scientist on this voyage to the deep is Dr Tim O’Hara from Museums Victoria. 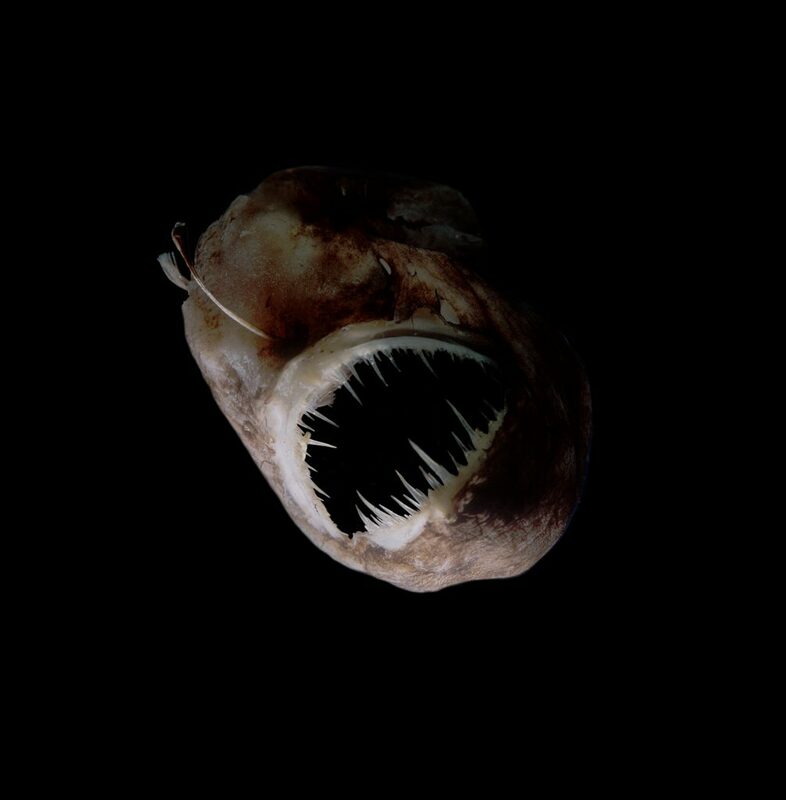 Tim says the abyss is the largest habitat on the planet, covering half the world’s oceans and one third of Australia’s marine territory, but that we know very little about it. “Abyssal animals have been around for at least 40 million years but until recently only a handful of samples has been collected from Australia’s abyss. “We’ll be using multibeam sonar to map the structure of the seafloor, and sleds, grabbers, cameras and nets to collect samples of the animals, including trialling what we think is the largest fishing net ever deployed in the abyss. Dr Tim O’Hara stands on Investigator’s rear deck amongst nets and sleds that will soon to be sent to sample life in the abyss. Image Matthew Newton/Marine Biodiversity Hub. The scientists are expecting to uncover a range of never before seen species; everything from sea fleas, crabs, shrimps, worms and snails, to anglerfishes, rattails, and sharks. As food is scarce in the abyss, animals are often small and move slowly. Many are jelly-like and spend their lives floating about, while others have ferocious spines and fangs and lie in wait until food comes to them. “The abyss is a world of jelly and fangs, with miniature monsters gliding up and down waiting for prey,” Tim says. Stay away from the light! The Humpback Blackdevil uses a bioluminescent light to attract its lunch. Image David Paul. During the voyage, scientists will try to keep specimens alive in on board aquaria to study their unique adaptations to the dark, frigid environment of the abyss. They will also take videos and photographs, to show the world what lives deep down in Australia’s marine reserves. The voyage will also look for microscopic pieces of plastic in the water and on the seafloor, to trace the impact of humans on this remote environment. While the voyage will be busy, with surveys being carried out in shifts around the clock, much of the work for our deep sea scientists only just begins as the specimens are hauled on board. Many more years of identification, analysis and forensic work will likely follow. Researchers will seek to map patterns of biodiversity and evolution across the deep seafloor, and analyse the chemistry and DNA of tissue samples to reconstruct deep-sea food webs, and links between deep-sea populations. In a poorly studied environment such as the abyss, every observation made, each specimen collected is important. This data will lead to better understanding of the abyssal environment, and the creatures that live there, knowledge which is vital for the effective management of these remote and unique areas. The Deepsea Lizardfish is one of the world’s deepest living apex predators and will not hesitate to try to eat anything it meets! Image Dianne Bray. “What I’m really excited about is mapping the abyss. What patterns are we going to find down there? Are the animals off Tasmania the same as those off Queensland?” Tim says. This voyage offers a rare opportunity to shine a light into the deepest parts of our region’s oceans. Who knows what weird and wonderful animals of the deep our voyagers will find! Follow Investigator’s voyage to the abyss via social media using #RVInvestigator and #abysslife or find out where the ship is right now using our Near Real-Time Underway Data portal. ‘Sampling the Abyss’ is being led by Museums Victoria, with support from our Marine National Facility and the National Environmental Science Programme Marine Biodiversity Hub. This article was originally published by Bryony Bennett on the National Environmental Science Programme Marine Biodiversity Hub website. Bryony is a Communications Advisor working with the National Environmental Science Programme. absolutely awesome, thank you for this article.